Here, here, you sing and now / Between me and what I see / lives eternity". Throughout there is a unifying voice that is all Rappaports own and (unimaginably) blends scepticism with mysticism. 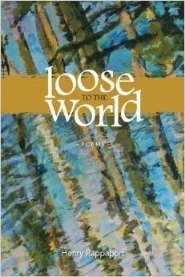 The poems present themselves as both playful and worldly wise. These are poems that prefer understatement to hyperbole, with the capacity to compact turns of phrase and occasional rhyme so as to maximise their energy. The very structure of the book -- stating and then returning to themes -- enhances the energy and freshness of the collection by placing contrasting poems in juxtaposition. Rappaports voice makes the reader lean in so as to better hear what will next be said: I sometimes wonder who / else is livin gin this body". His voice makes witty, humorous, truthful observations with a facility of language that is confident, relaxed, playful, and all his own.